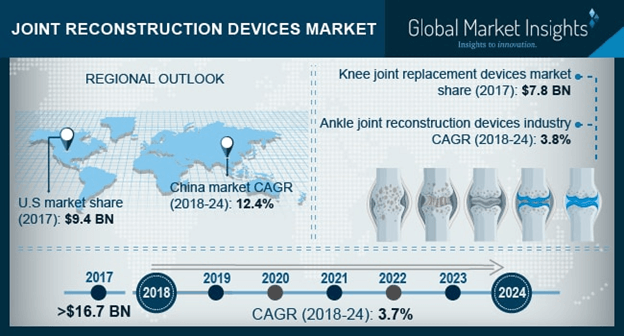 Joint Reconstruction Devices Market size is set to exceed USD 21.5 billion by 2024; according to a new research study published by Global Market Insights, Inc. Rapid rise in number of joint replacement surgical procedures in North America will fuel the joint reconstruction devices market growth over the forecast period. As per the American Joint Replacement Registry, more than 7 million Americans have had hip or knee replacement surgery till present, accounting for almost 85% of the total joint reconstruction and replacement market. With the aging American population, the number of people suffering from arthritis is projected to increase to 67 million by 2030, that is around 25% of adult American population. Increase in number of joint reconstruction surgeries in North America will boost the regional joint reconstruction devices market growth in near future. Increase in geriatric population in Asia Pacific countries such as India, China and Japan will augment demand for joint reconstruction devices. The Asia Pacific region is witnessing a rapid rise in the number of people over the age of 65 and require frequent use of joint reconstruction devices due to deteriorating bones and tissues. According to the World Health Organization (WHO), the average life expectancy of people is 83.7 years in Japan and 82.3 years in South Korea. Hence, with increasing geriatric population that is at a greater risk of getting affected by musculoskeletal disorders, the demand for various join reconstruction devices will rise in coming 5-7 years. Biocompatibility issues is an increasing concern in the joint replacement surgical procedure and may contribute to the rise in failure rate of the implanted devices, therefore impeding the market growth. Biocompatibility of the implants include the way the implants initially Osseo integrate within bone, potential adverse effects of byproducts. High cases of joint reconstruction implants failure rate will decline the product demand hampering the joint reconstruction industry growth. Hip replacement reconstruction devices market valued over USD 6.6 billion in 2017. According government statistics, the number of hip replacements surgical procedures performed in U.S. have increased substantially and have become more common in the younger population. Easier fast recovery, durability of hip replacements, cost effective way to improve the patient’s quality of life and old people’s willingness to accept the limitations accompanying arthritis will lead to growing product demand, boosting hip replacement devices market growth. Shoulder replacement reconstruction devices market will grow at 3.6% CAGR over the projection period. According to the American Academy of Orthopedic Surgeons (AAOS), the nationwide total number of shoulder replacements increased from 18,000 to 45,000 in the last decade. The number of shoulder reconstruction surgeries have skyrocketed in United States as recent technology improvement and aging population seek to restore function and relive pain related to arthritic shoulders, propelling the industry growth. Japan joint reconstruction devices market was valued around USD 858.1 million in the year 2017. A nationwide survey of the total hip fractures conducted by Japanese Orthopedic Association (JOA), found drastic increase in the number since the last decade. The rise in number of bone fractures along with increase in geriatric population will foster more opportunities for the Asia Pacific joint reconstruction devices market. India joint reconstruction devices market is estimated to grow a 11.8% CAGR over the projection years. Total knee and hip replacement are the most common surgical procedures practiced across the world and its application is rapidly rising in India. According to the recent survey it was observed that around 70,000 joint replacement surgical procedures are carried out in India annually and expected to increase at significant rate in near future. Factors such as rising geriatric population, increase in prevalence of musculoskeletal disorders, improving healthcare infrastructure and expenditure in the country will favor the growth of joint reconstruction market in India. Prominent industry players include include Stryker, Zimmer Biomet, Medtronic Spinal, Smith & Nephew, DePuy Synthes Companies, Integra LifeSciences and Aesculap Implant Systems The industry players use new and innovative strategies such as improving their manufacturing footprint, merger and acquisition, new product launches and geographical expansion for improving their market place.